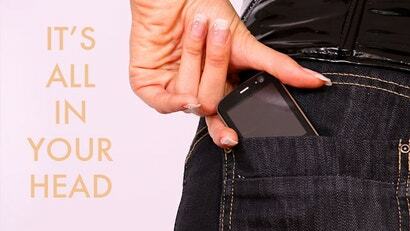 Your phone is vibrating in your pocket — but when you check, it really isn't. The good news is you're not going crazy. This phenomenon, called phantom phone vibration syndrome, is increasingly common. The bad news is you might have a tech addiction. Our body is always in waiting to anticipate any kind of technological interaction, which usually comes from a smartphone. With that anticipatory anxiety, if we get any neurological stimulation, our pants rubbing against our leg for example, you might interpret that through the veil of anxiety, as "Oh, my phone is vibrating." In this increasingly connected world, the syndrome is fairly common. Here's how to tell if imaginary cell phone vibrations is a cause for concern: Ask yourself if you feel anxious about being connected and whether that anxiety is interfering with anything else in your life. To counter the anxiety, Rosen suggests not carrying your device 24/7 and taking 10 to 15 minute tech breaks every couple of hours to reset your brain. Good advice, whether you've got phantom cell phone vibration syndrome or not. Also, learn to live without push notifications and turn on only the actionable alerts to preserve your sanity and make you more productive.